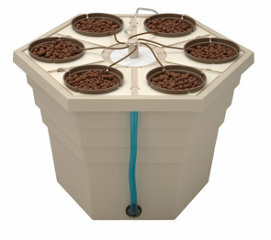 The EcoGrower incorporates an air driven "spider" drip system and uses a revolutionary hexagonal reservoir with removable six inch lid inserts. Each lid insert will accommodate one 6" (15 cm) net pot that can easily grow very large plants. This system is sized 2â€™ x 2â€™ (60 x 60 cm hexagonal), and 43 cm high.